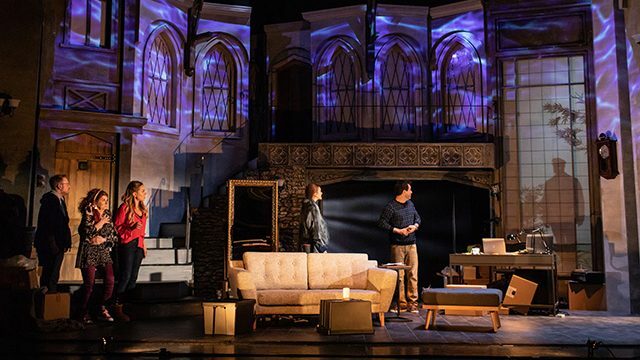 A modern-day ghostly thriller adapted from the best-selling 2015 novel and based on the author’s own real-life experience in a haunted house, Peter James’s spine-chilling stage play arrives at Leeds Grand Theatre from Monday 29th April. The House on Cold Hill stars BAFTA-nominated actor Joe McFadden as Ollie Harcourt. He is joined by award-winning actors Rita Simons and Charlie Clements with Persephone Swales-Dawson making her stage debut. The company of The House on Cold Hill. Credit: Helen Maybanks. Peter James reunites with two-time Olivier-nominated theatre producer Joshua Andrews, the Olivier award-winning director Ian Talbot and award-winning writer Shaun McKenna to bring audiences The House on Cold Hill. It becomes the fourth play in James’s box office smash hit and critically-acclaimed stage franchise following the huge sell-out success of Not Dead Enough, The Perfect Murder and Dead Simple.